I received a comment asking me to blog about the content of the conference. I think I will take the easy approach here refer you to Susan Bradley's blog because she is here and who could blog more or better than Susan? I actually got a picture of Susan not blogging - a somewhat unusual happening. 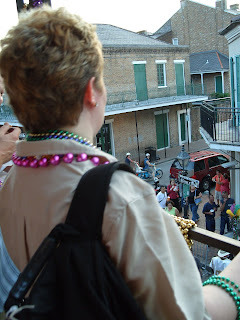 And, you can see this picture and more plus some parade videos - Jeff arranged our own New Orleans parade - at here.